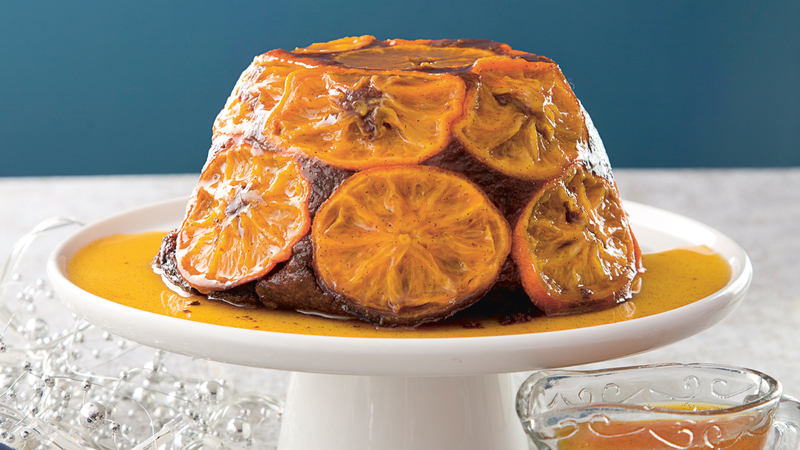 Sharon's Chocolate and Clementine Pudding with Sticky Grand Marnier Sauce will take centre stage of any dinner party. 1. Preheat the oven to 190°C/gas mark 5. Heavily butter a 1.2 litre ovenproof pudding basin. 2. Slice three of the clementines and arrange them on the base and up the sides of the bowl in even rows. Set aside. 3. Put the chocolate in a medium bowl with the butter and melt over a pan of simmering water or in the microwave. Remove from the heat and leave to cool a little. 4. Separate the eggs into two large bowls. Whisk the whites until stiff, then add half of the sugar and whisk until stiff and glossy. Whisk the yolks with the remaining sugar until pale. 5. Add the chocolate mixture to the egg yolks and finely grate in the zest of the remaining clementine. Add the ground almonds, cocoa powder, baking powder and vanilla extract and stir everything together until well blended. Gently fold in the egg whites. 6. Spoon the mixture gently into the prepared basin, spreading the top smooth. Put the basin on a baking tray and bake in the oven for 40 to 45 minutes. Once cooked, a skewer inserted in the centre of the pudding should come out clean. Remove from the oven and leave to sit in the basin for 15 minutes. 7. Meanwhile, to make the sauce, put the sugar, orange juice, Grand Marnier or Cointreau and vanilla seeds in a wide pan over a medium heat and slowly bring to the boil, stirring until the sugar has dissolved. Leave to simmer for 15 to 20 minutes, until reduced by half and thickened to a syrup. Remove from the heat and keep warm. This can be made up to four days in advance and kept covered in the fridge, in which case the sauce will need to be heated through gently to loosen for serving. at once with the remaining sauce on the side along with some crème fraîche or custard.